In real life, I turn a bit green at the sight of a butcher shop. 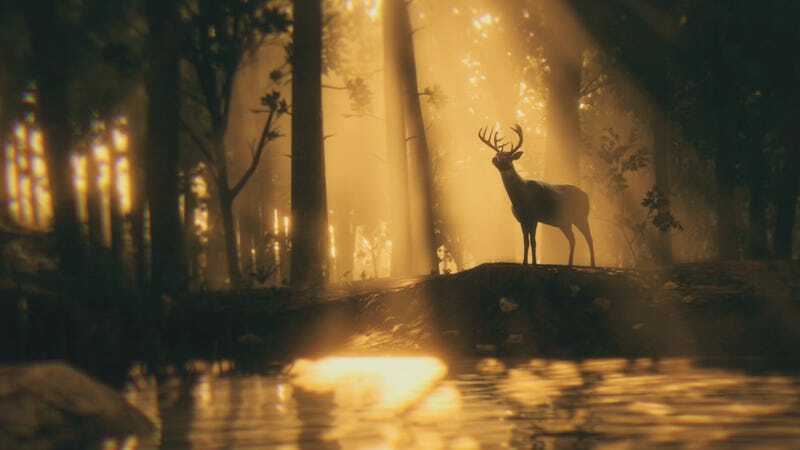 In video games, I am a merciless killer of monsters and, in Red Dead Redemption 2, deer. If you want to get into the game’s hunting, allow me to be your guide. Video games are all about escapism, right? This is what I tell myself when I get worryingly into farming dragons for a new hat in Monster Hunter or stalking legendary animals all over Rockstar’s pretend America. I’ve spent many hours hunting deer, wolves and other creatures in Red Dead, not for the rewards (which are pretty meh) but because I find it weirdly enjoyable. Perhaps it is an outlet for my inner carnivore. I suspect hunting is going to be a big part of Red Dead Online, so getting familiar with it now might let you steal a march on the other cowboys when that launches later this month. You see animals all over the place in Red Dead. As you ride around, Arthur will make annotations on the map showing where various species can be found. The woods up in the mountains are my favorite place to hunt, despite the risk of being interrupted by bears or wolves. You can at least see them coming, unlike the damn alligators in the south. I don’t even feel slightly conflicted about murdering those. Click both sticks in to highlight animals and animal tracks in your field of view. Irritatingly, this also highlights pickable plants, and the plumes of light from them can obscure other information. This view also doesn’t distinguish between the tracks of, say, squirrels and stags, so you might carefully follow a trail only to find a thoroughly disappointing skunk at the end of it. Press R1 to focus on a track and it will stay highlighted for you. You have to be crouching to follow it — stand up, and the track will disappear quickly. To avoid animals seeing, hearing and smelling you, get into a crouch position and use Cover Scent Lotion, which can be bought or crafted. Predator bait or herbivore bait can also be bought or crafted. I rarely use it, because following animals is quicker than waiting for them to come to you. If you call out to animals, they’ll briefly lift their heads before running away. You can get a headshot in if you’re quick, but if you’re me, you’ll also feel terribly guilty about it. There is no point in mowing animals down with a shotgun. It ruins the pelts. (Also it’s not fun, you monster.) With the exception of legendary animals, which you can kill pretty much how you want, you need a clean shot to get valuable materials from any animal. Use a single poisoned throwing knife or poisoned arrow, or get a head or heart shot with a bow or high-caliber rifle for a clean kill. A bow will do nothing to a big animal like a bear: you’ll need to craft reinforced arrows or use a long-scope rifle. Tiny animals need to be shot with a Varmint Rifle or special small-game arrows. When you’ve levelled up your Dead Eye stat enough, you’ll see the fatal areas highlighted in red on an animal in Dead Eye view. It matters how far away you are and the angle you hit from. An arrow won’t penetrate a skull at long range. I’m sure video game hunting is about as close to real hunting as Forza Horizon is to real driving, which makes me feel a bit better about enjoying it, but this much is still true. This confused me for hours. I would kill a boar or, once, even an alligator with one shot to the head and still end up with a poor or average pelt when I skinned it. Here’s the trick: when you’re tracking, use your binoculars to look at animals and press R1 to analyze them. This will tell you the quality of the animal itself, as well as adding it to your compendium. You’re looking for the word “pristine.” Kill a pristine animal with a clean shot and a perfect pelt shall be yours, as well as its meat. Once you’re examined an animal through your binoculars, pressing R1 will also show a text box telling you exactly what weapon to use for a clean kill. This is easily the most exciting way to hunt, and it yields perfect pelts too. If you’re able to run down an animal like an elk on your horse, you can capture it with your lasso and then approach it to slaughter it with a knife. No gunshots required. Unfortunately this is also the grisliest and therefore least vegetarian-friendly method of killing pretend animals in this video game. When you kill an animal, you can either skin it, strap its carcass to your horse, or put it in your satchel if it’s small enough. Huge creatures like bears, elk and alligators won’t fit on your horse and must be skinned. Skinning gives you meat, parts like teeth, and a pelt that you have to store on your horse. Whole carcasses can be donated to camp for all their meat and parts, and they command a good price at a butcher’s. The skinning animation is super gruesome and unskippable. I understand that this is an immersion thing, but still, ew. Pity the Rockstar artists and animators that had to spend months modelling skinless animals. I hope none of them were vegetarians. What are the rewards for hunting? In short: clothing and trinkets. Legendary animals give you unique trophies like fangs or skills that you can take to the fence to craft into talismans that give you fairly meaningless stat boosts, like a 10% increase to your Dead Eye experience gains. Take pelts to the trapper in St Denis or out in the wilderness and he can turn them into outfits, most of which look ridiculous. Bring perfect pelts and other trophies back to Pearson at camp and you can use them to craft decorations for the place, like a wolfskin rug for the campfire or an alligator-skull decoration for Arthur’s tent, if you want a bunch of dead animal bits decorating your living space. More usefully, he can craft satchel upgrades that let you carry more stuff. And, of course, you can sell hunting spoils for money. Help, I hit something and I can’t find its body! Sometimes injured animals will make a run for it. On your minimap or the main map, zoom and you’ll see icons marking animal corpses nearby. They hang around for a good while before disappearing. Doesn’t becoming an expert in virtual animal murder make you a bit of a hypocrite, you lily-livered lettuce lover? I dunno. Probably not, because it’s pretend, and because virtual hunting is about 3% as gross as real-world industrial farming, so you can enjoy it guilt-free.